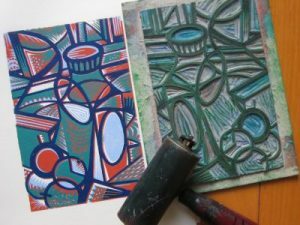 In this hands-on workshop, you will create a multicolor print from a single block of linoleum. The “reduction cut” process involves carving a design from a linoleum block, bit by bit, printing each color in sequence from light to dark, layer by layer. Each color is printed first, then cut away from the block before introducing the next color. A fun challenge as all work, from start to finish, is done in reverse of the final print. Bring a bag lunch. Holly Berry is an illustrator and block printmaker living in Waldoboro, Maine. She earned a BFA from Rhode Island School of Design and has illustrated many award-winning children’s books, toys and products. Along with illustration, Berry makes relief prints of varied subject matter, which have been exhibited in juried and invitational shows throughout the country. She was recognized with an Individual Arts Fellowship in Printmaking by the Maine Arts Commission and her work was recently included in the Maine-Aomori Print Exchange between Maine and Japan. www.hollyberrydesign.com. Space is limited and pre-registration is required.